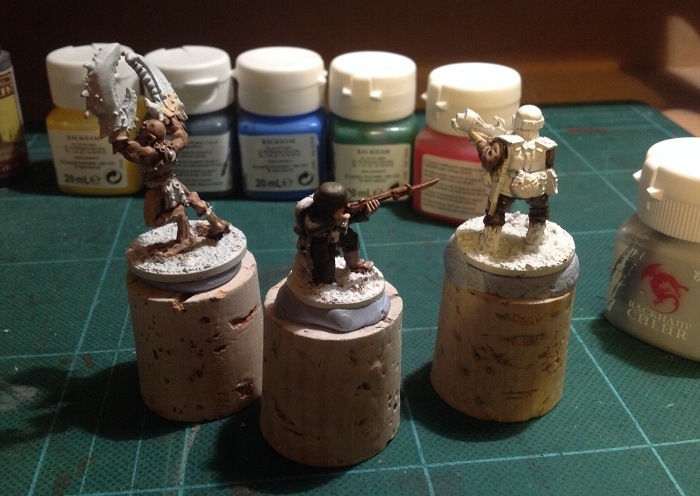 Well I actually sat down and splashed some paint on some figures yesterday. First time in ages. The photo isn’t supposed to show you any gorgeous work, it’s just to forestall the “pictures or it didn’t happen” comments. I’ve recently been doing a lot of sorting out of my accumulated books, games, models and so on with a view to getting rid of what I don’t need. Dumped 400 books last week, which meant that the remaining few thousand should fit on the shelves I’ve got. I talked about sorting games out in one of my Ravage articles, and I’ve been doing that too. No bites on games when I offered them to my local club members, so it’s off to Ebay for a whole stack. Even if the games are good, I’m just not able to play everything, so I’m being a bit more realistic about what I’m going to get on the table. Ever. Actually, there is a step between deciding that I won’t play and sticking things on Ebay. Most things get pushed through a repurposing filter to see if I can find them another home in something I do play. This both saves money for buying new toys, and also saves time as I don’t have to faff about with Ebay quite as much. it’s also quite liberating as you don’t feel so bad about hacking models up (even if only theoretically) once they’re consigned to the great car boot sale in the sky. One of the other major things I need to do is get them painted. Having thought about this as I tidied, I realised that I’ve not painted for so long that I’ve forgotten how to do it. Luckily some of the unwanted models can also be used as stunt doubles so that I can make my most egregious painting errors on things that I don’t actually want to keep. It’s less inspiring painting stuff I don’t want, but until I find a style I’m comfortable with and can actually get the effect I want with it, then I might as well avoid any need to use the paint stripper. So last night’s start was predictably frustrating. One of my old failings was being so subtle that you couldn’t see the result. Looking at the models this morning you’d never guess that each had 4 or 5 coats, shades, washes or whatever. That’s a bad habit I need to lose. It’s funny because I know a great deal about painting from a technical viewpoint. I’ve even written painting guides in my time. However, knowing it intellectually is not the same as having the experience and muscle memory to put any of it into practice effectively. So I need to spend some hours at the brush, getting at least a basis of that back. The aim, of course, is to come to some process whereby I can paint the armies I want in a time I can afford to spend and to a standard that makes it worthwhile. If it’s too slow or too rubbish then there’s no incentive. I’m sure there is a way of doing this, and I’m equally sure that it’s just a matter of practice to get there. Making myself wade through the depressingly crap stage is the hardest part. Meanwhile, my bookshelf is increasingly looking like the Rick, Jake and Alessio public library. So we can pop over to yours if we need to look anything up? Cool. Yep. Just give me a bit of notice, I’ll put the kettle on. My “speed” painting (basically limiting number of paint layers to what really counts) is still averaging about four hours a figure if I include all prep time. My new plan to speed this up is to train and press the rest of the family into painting figures. Have to see how that goes. I plan to get some more brushes sized for special tasks like painting eyeballs with one dab but I am having a hard time getting the average below four hours as improved quality vs faster painting is a struggle. Getting closer to spending some time with the airbrush but do not have a lot of hope that airbrushing will save me time as I am not painting large armies. All set for some more plaster casting using all I have learned so far. Hopefully I am getting closer to casting perfection. Casting is a whole other world of amusement (and mess). As, in a way, is learning how best to pressgang family members into painting things for you. For the moment I’ll stick to teaching myself and work up to the press-ganging later. I sort of have a plan. A good idea in theory. (Un)fortunately I grew up with large armies of 25mil ancients being the “proper” way to game and I find it very hard to shake. Skirmish gaming with my Eternal Battle rules is my way of dabbling in every period or model range I find interesting. P.S. Why not shill your unwanted minis on your blog before putting them on ebay so you avoid fees? Thanks Ben. I could stick the games on here, and may do so. It does cause more problems if things go astray in the post though. Plus the Ebay process imposes a timescale and discipline on me which would probably be helpful too. The Rackham paints were just the first ones that came to hand last night. happened to have an unopened starter paint set within arms reach. Like I said, lots of gubbins yet to sort through. I don’t know whether I like them or not yet. So far they just seem like paint. Sadly I have the paints from the starter already. I’ve got about half the paints they did and could easily duplicate the majority of the rest with what I have from other ranges. They do a few colours which aren’t so easy to get and they also have a matte finish to them which means they don’t always mix well with other ranges. RIght, I’ve noted “doesn’t play well with others” in Mr Rackham’s file and will be contacting his mum. Can’t be having that sort of nonsense. Seriously though, I’m sure they’ll be fine. Yesterday I only used R paints, so they had no problem behaving. Jake, I heartily recommend the “Army Painter” method of getting models finished. I used to be the type who would spend days getting a single model just right. Using Army Painter I recently finished an entire Flames of War starter box set in under two weeks, painting at most 2-3 hours in an evening (usually far less). Even if you don’t use any of their products, the method is really great. You can use a can of thinned down Minwax (or equivalent) instead of their quickshades. I still use a load of other colors from Vallejo and Privateer in addition to the color sprays and paints they offer. It does require a bit of “Unlearning” the way of primer/base coat /layer/wash/highlight so many of us learned as younger gamers, but I’m well satisfied with the results (whole forces of spiffy painted models instead of grey plastic/bare metal/black primer). A quick googling of “the Army Painter” will get you to their site. Look for the painting guide on the right hand side. But I use drybrushing and washes (and AP dips) rather than blending and highlighting. Your standard troops never even get their eyes done (poor fellows!). Only the heroes and special troops get significant time. Including prep time (trimming flash etc., scraping mold lines, glue, doing a very simple base), I’m probably down to about or maybe just under an hour total per grunt, but much more for a hero or some guy that’s otherwise special. I’ll do 5-10 grunts in one go, that makes it a lot faster. I also use an optivisor, that also speeds things up quite a lot – I can see much better! Good luck, look forward to hearing how this comes out! I am also an enthusiastic fan of The Army Painter method and their products. I love their stuff. I have painted about two hundred figures with The Army Painter method. I will admit that it is not great artistry however it is much better than bare plastic figures. + 1 for The Army Painter. Thanks for the suggestion. I’ve got some of the AP inks and tried them on these models last night as a last thing (assuming they would take the longest to dry). I can’t say I was terribly happy with the results, but I know I’ve seen armies at conventions that were done that way and looked really good. As with all these things, I just need some practice and to try things out a few times. I don’t expect things to be perfect first time out. What i’m after. They dont need to be eye catching just look reasonable good. Skimish games with low count minis in, i would spend more time. As having tiuch stuff i never play i know what you meen. Just out of curiousity, Jake, what was it about the models you did up with AP that you didn’t like? Was the shade a bit too thick? The first time I tried it, I didn’t shake the models well enough, and a poor guinea pig friend now has a pack of PP pressgangers that are so well varnished, a tactical nuke couldn’t scratch ’em. I like to think it adds a nice, dark, swarthy element to them…! It was quite dark, yes. I’ll try shaking the bottle more to see if that helps. I expect it’s just lack of practice (so I’ll have some more). Another possibility is that it doesn’t suit whatever native style I have and which may be trying to exert its influence. I’ve tried some techniques that I understood in principle, but could never make work in a way I liked the look of – even when sitting next to someone who was an expert and could help correct my every mistake. The act of blogging about painting and modeling has been a catalyst which has helped me to increase my output of painted models dramatically. Looking at old blog entries is a helpful reflective process. Keep blogging your efforts and you will find it helps with your output as you create mental deadlines to finish models. Deadlines are great, think about how many models get finished because you wanted to use them in a game. We gamers and modelers are always interested in what our games designers models look like – I remember Andy Chambers once painted just about the most characterful Skaven army ever seen! Getting back on the horse after a break is tough. The period producing work that one feels isnt as good as it used to be is hard to cope with. I do know that finding a sweet spot between realistic productivity goals and realistic quality goals made everything about the process easier and more pleasant. Its an ok article with some pertinent points when it comes to planning long term, time consuming projects like army painting. It certainly got me thinking about the realism of some of my toy soldier goals a bit more critically. I hope that you soldier on and get something that you are happy with finished Jake. If you are looking for a deadline then I will be at the Mantic open day at the end of November (Im the Irish DreadBall champion dont you know 😀 ) and I will be happy to critique your work in person. An interesting article there. I had already come to a similar sort of rebellion against the “X things to do before you die” lists that permeate every medium of communication these days. Mostly because I don’t actually want to do so many of them and do want to do many other things. They’ve plainly written by someone who isn’t me and doesn’t think the same way. Fine, but irrelevant. Some of the missing things are to do with toy soldiers and playing games. No, really. I know it’s a shock, but there you go. If I happen to paint anything Mantic related then I’ll be happy to stick it in one of the cabinets at the open day. Assuming it’s not too eye-bleedingly awful. You can tell me what you think then. Which is my long winded way of saying that in my opinion in order to get an army finished one needs to paint smarter, not harder. I do hope that you get a chance to get a Mantic figure painted before the Open Day Jake. A fun (and likely achievable) goal. As for the title, it was definitely fun getting it. We will see how it fares internationally. Either way, I was looking at some Mantic figures this afternoon, trying to decide what I might have a go at. I’ve got a little while to decide.